DOJ: HLF's Bid To Vacate Trial Outcome "Strains Credulity"
Their 2008 convictions have been upheld on appeal and the U.S. Supreme Court refused to take up the case. So five men convicted of illegally routing millions of dollars to Hamas through a Dallas-based charity are trying the only ploy they have left – blaming their lawyers and asking for new trials. A new attorney claims the five former Holy Land Foundation (HLF) officials filed a petition in October claiming that, if not for the mistakes made by their counsel, Mohamed El-Mezain, Shukri Abu Baker, Ghassan Elashi, Mufid Abdulqader and Abdelrahman Odeh would be free men. Instead, they are serving sentences ranging from 15 to 65 years in federal prison. The case turned on the issue of whether West Bank charities, known as zakat committees, were controlled by Hamas, attorney Gary A. Udashen argued in filing court papers last October seeking to toss out the verdict. Defense attorneys failed to call witnesses from the seven zakat committees named in the indictment to testify at trial. He submitted new affidavits from 13 people who said their committees were independent and not controlled by Hamas as prosecutors argued. That ineffective assistance of counsel merits vacating the verdict, Udashen wrote, because if those witnesses testified, "the jury would almost certainly have found these defendants not guilty." In a response filed late Friday, attorneys for the Department of Justice said Udashen's argument ignores "the mountain of evidence proving that the committees were controlled by Hamas." The original defense attorneys were chosen by the defendants themselves, and brought decades of experience in terrorism and national security cases. Those attorneys fought to a mistrial in the case's first prosecution in 2007, securing several not guilty verdicts. But jurors hung on dozens of other counts, prompting re-trial a year later in which they were convicted of the remaining charges. The trial judge called defense attorneys "accomplished" and "competent," while the Fifth Circuit Court of Appeals lauded them as "world class." In fact, the appellate court found merit in several defense claims of trial errors, but ruled that those errors did not affect the outcome or render the trial unfair because of the overall strength of the evidence. "It strains credulity to assert now that these same attorneys performed in so deficient a manner as to violate the due process rights of their clients," the DOJ reply said. But the defense attorneys also filed affidavits saying they made mistakes in contesting the zakat committee issue. The Fifth Circuit rejected that view in its 170-page opinion, calling the evidence tying Hamas to the zakat committees "substantial," and "perhaps the strongest evidence that the defendants' (sic) provided support to Hamas after Hamas was designated as a terrorist organization." 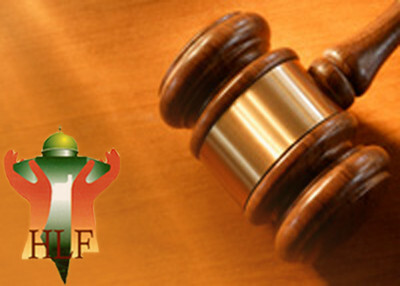 The court cited "the overwhelming nature of the connection between HLF, the zakat committees, and Hamas ... We believe that a jury could not help but infer from the above evidence that the defendants had a close association with Hamas and that HLF acted to fund Hamas both before and after Hamas's designation as a terrorist organization." Documents seized by the FBI show that HLF was a part of a group called the Palestine Committee, a creation of the Egyptian-based Muslim Brotherhood to help Hamas politically and financially. Those documents, seized from the home of the committee's archivist during the execution of a search warrant, show that HLF was the "'official organization' for raising money" for Hamas, the DOJ reply said. HLF sent more than $4 million to the zakat committees named in the indictment. Other exhibits, including conversations among the defendants that the FBI recorded, showed that the group discussed the committees and their control. A letter discussed individual committees, identifying which were "ours." In one example, the letter says a committee in Hebron is "ours" because it "has Abdel Khalik Natshe and Hashem al Natshe, our people." Natshe was a senior Hamas member in the West Bank. And several defendants were present during a secret 1993 gathering of Hamas members and supporters in Philadelphia. The meeting was called by the Palestine Committee to discuss ways to derail U.S.-led peace talks that Hamas opposed. To set the 2008 verdict aside, the defendants must show "that their trial was so fundamentally unfair as to make the result unreliable," the DOJ reply said. They have not met that burden. "The Fifth Circuit expressly found that petitioners received a fair trial, and that the evidence of guilt was formidable." While the witnesses identified in HLF's petition to toss out the veridct were not called in 2008, defense attorneys vigorously contested the prosecution's claim that the zakat committees were controlled by Hamas, the DOJ reply said. This was done in pre-trial motions and arguments and through the cross-examination of prosecution witnesses. Defense attorneys also tried to get the witnesses to provide depositions that could be used during the trial when it seemed they were "unwilling to travel to the United States to testify on behalf of the Defendants." That is enough "to defeat a claim of ineffective assistance of counsel," the DOJ reply said. The affidavits now offered by the defense in hopes of vacating the outcome carry little weight because the witnesses were not cross examined. In addition, "none of the affidavits that petitioners present here indicates that the affiants were willing and able to come to Dallas to testify at trial." Udashen raised a series of other arguments, including a claim that his predecessors could have argued the HLF defendants were entrapped by the government. The DOJ reply offers reasons why defense attorneys had a good-faith basis for those decisions. The relief Udashen seeks is rarely granted. While the court will decide on the issues he raises, his pleading – especially when it comes to the strength of the evidence – is based on arguments already rejected by the jury, the presiding judge and the Fifth Circuit Court of Appeals.